Zero emission electric-vehicles are not only needed on the roads, but there is also a big chunk of transportation through sweat and salt waters, especially the movement of cargo. Europe is on its way to electrify the inland shipping of cargo through electric vessels. PortLiner has introduced their electric vessel (EC110) that offers zero-emission inland shipping using a sustainable energy source such as giant removable battery-packs or hydrogen fuel containers. Inland shipping connects ports built on rivers, lakes, and waterways through a region to provide a cost-effective transportation solution, mainly used for shipping of goods in containers. 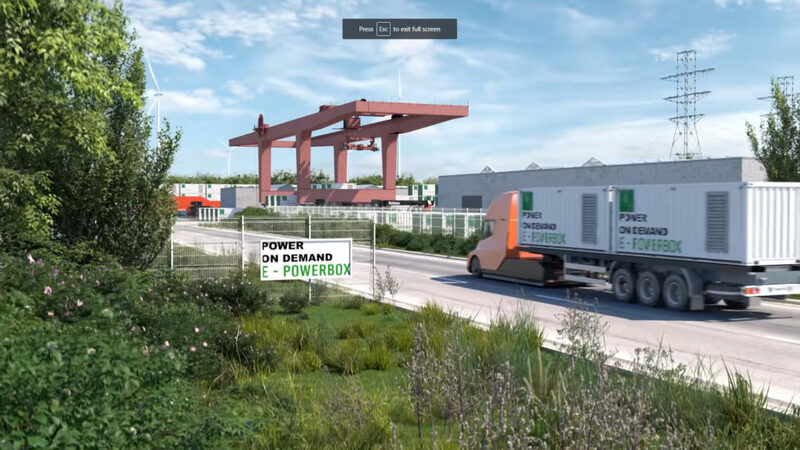 PortLiner from the Netherlands aims to build a zero-emission goods transport eco-system with the help of smart electric-vessels and electric trucks and surely they prefer the Tesla Semi Trucks as they have shown in their demonstration video (below). The CEF funding will contribute strongly to speeding up the realization of the project and give real momentum to the electrification of inland waterway shipping in Europe. 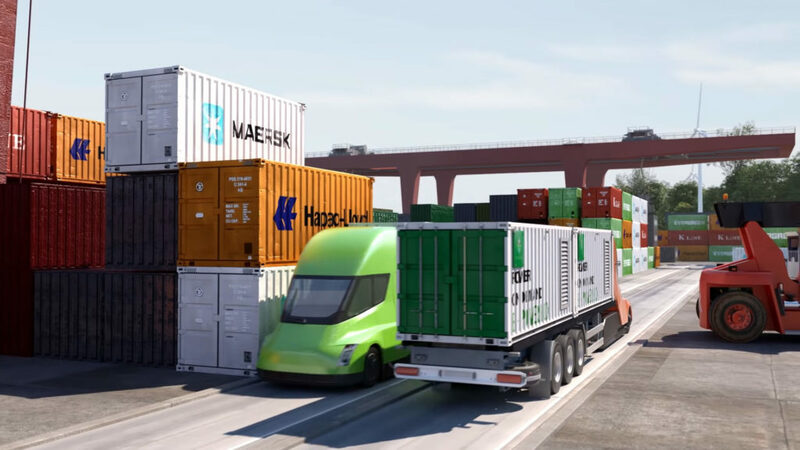 Trucks are an integral part of the shipping cycle — since this is a zero-emission shipping project Tesla Semi Trucks seem to be the obvious choice for the players involved as we can see in the following video, you might want to skip to 3:00 to see rendered Tesla Semi Trucks in action. We think PortLiner has truly innovated the way traditional shipping vessels work, with the absence of an engine room, the EC110 electric-vessel gained an 8% extra room for cargo placement. EC110 electric-vessel dimension is 110 x 11.45 meters (L x W) which allows it to fit fourteen 20 ft. containers in its length and since the advent of larger 40 ft. containers, the ship is able to fit seven containers in its length in a single layer — the EC110 electric barge is able to stack up to 280 containers of 20 ft. at full capacity. The adjustable wheelhouse of the ship is able to move vertically up and down in-case of an upcoming bridge that has a low height of 5.6 meters — the EC110 vessel is also able to flood down to the height of a single container to cross bridges when fully loaded with 280 containers or more. Electric vessels will start their operations soon in Europe at least and if this trend starts to proliferate, the demand of the Tesla Semi Trucks will further increase — to imagine the potential scale of electric vessels we need to know that there is a network of hundreds of inland ports around the world you can browse the list at Wikipedia here. Tesla Semi Trucks have already caught the attention of giant corporations and smaller customers in North America and UAE who have placed hundreds of pre-orders for the next-generation electric hauler. The world is moving toward a zero-emission transportation ecosystem, but we need more governments and corporations to get involved and try to improve the probability of a sustainable future. Let us know your thoughts on electric vessels and Tesla Semi Trucks combination on achieving a zero-emission transportation lifecycle in the comments section below.